Figure 5. Vibration Dampener Installation. and assemble new vibration dampener and hub. dampener (Figure 4, Item 4). Install eight bolts (Figure 4, Item 5). with long end of hub facing inner cone (Figure 5, Item 5). cone pointing toward vibration dampener and hub assembly (Figure 5, Item 3). 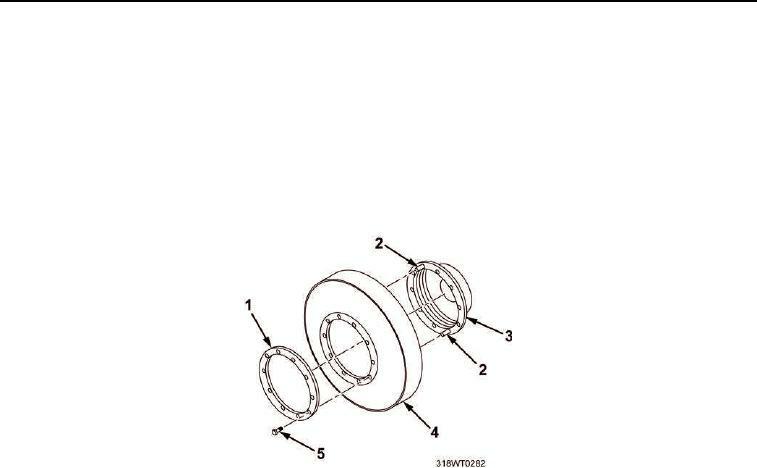 Install pulley (Figure 5, Item 1) on crankshaft (Figure 5, Item 4). bolt (Figure 5, Item 8) to crankshaft (Figure 5, Item 4). Using torque wrench, torque crankshaft pulley retaining bolt (Figure 5, Item 8) to 180 ft-lb (244 N·m). Using a dead blow hammer, strike end of crankshaft pulley bolt (Figure 5, Item 8) a sharp blow. Using torque wrench, torque crankshaft pulley retaining bolt (Figure 5, Item 8) to 300 ft-lb (407 N·m).